James Hayward, outfitted in blue jeans and a white ten-gallon hat, leads us around the grounds of his Moorpark ranch. He has a six-shooter in his right hand and a lit joint dangling from his pursed lips. The ground below his shoes crunches and crumbles as he serves up his slice of the American Dream. Sitting on the bench of a blistered wooden picnic table underneath the canopy of a tree, he muses, “I don’t know what I’d do if I didn’t paint,” referring to it as a drug habit. He is certain he was born to wield a brush. This birthright—this indefatigable urge to stretch canvas and make marks and study the “heroes” (Titian, Pollock, Rembrandt) and contemplate technique and alchemize paints from scratch using hand-washed, cold-pressed linseed oil according to a 500-year-old recipe—is not only what’s keeping him in the game but what’s also injecting younger generations with inspiration. “Art’s a first-hand experience,” he says, “Meaning, when you walk up to it and you look really close at it, you discover things you didn’t see from across the room. You can’t have an intimate viewing [like that] with a cell phone. And I would bet that’s how most people experience art these days. It’s really kinda sad.” He takes a beat here to look at the clear blue sky. A mural of nature around him oozes into the future: his two furry mutts lay on the dirt, fat koi fish leaf in a still pond, leaves float down from above. Hayward makes it clear that the tales outlined in his recently finished book, a series of autobiographied anecdotes entitled Indiscretion, of benders, beatings, sexual deviance, madness, and all other manners of debauchery—have been the fuel for his creativity. Hayward’s pearls, his paintings, vary from being as chaotic as his war stories to as serene as our natural surroundings. One characteristic, however, remains universally consistent: making marks that are subconscious and all of equal importance. “Control is the bugaboo of art,” he says. “You have to pay attention, but you don’t want to have control. A long time ago, I figured out that I was trying to transcend that old AbEx thing where you go: action, reaction, action, reaction, where you’re the painter then you’re the critic, and I wanted to see if I could go beyond that.” This disdain of control is evident in his furious effort to remove conscious decision-making from his process. He often paints in the dark because he knows that he can think faster than he can paint, and in the darkness he’s able to take his critical mind out of the equation. 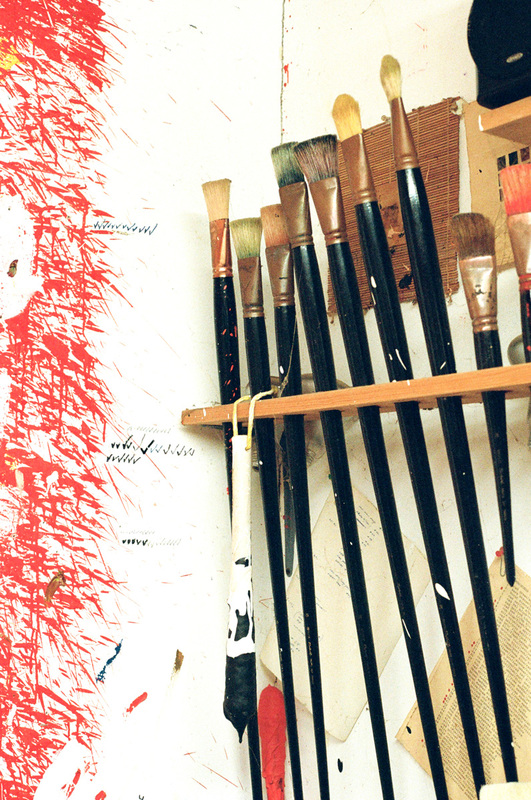 The result is a series of thrashing brush strokes that blanket the canvas. No one stroke is special. The paint is thick, coaxed into long, swooping streaks that curl into little crests. Looking at one of his paintings is like looking at an angry sea from above. The marks are wild and without purpose, but when one steps back and surveys the entire canvas, a vibrating whole emerges; the method transcends the madness. Detail, "Abstract #218," (2014). Oil on canvas on wood panel. 40 x 37 inches. Courtesy the artist and Roberts & Tilton, Culver City.